I Need a Raise. I Only Make $117,000! Did you know that in San Francisco, if you make $117,000 a year as a family of four, you are considered low income? It might be time to get out of Dodge when the Department of Housing and Urban Development makes that claim for your city. Imagine making $117,000 and qualifying for affordable housing developments! San Francisco may be idyllic to some, but the costs of living are unsustainable for its residents. It amazes me how that model can be sustainable. Honestly, it probably isn’t sustainable. It just means those who can’t afford housing in San Francisco simply have to live somewhere else and commute to work, which of course lowers the quality of life. I can’t imagine giving up one to three hours a day of productivity just to get to work. I already need a 28-hour day to get everything done without the commute! I have buddies who live in the Bay Area and own $1M+ homes, and they aren’t even in San Francisco. They live in very middle-class neighborhoods; you don’t even get a gate and a guard for those neighborhoods. It is a tough way to go but if the young whipper snappers can make it work, they can sell their Bay Area home and come retire here in Reno like all of our other friends from California. That is one thing that ends up being a plus — when you reach that point in your life where your asset has grown significantly in value. You don’t get opportunities like that in the Midwest, where most of the property values don’t fluctuate. The U.S. Housing and Urban Development released new income guidelines for who can qualify for its low-income housing assistance, and one city’s “low income” level is turning heads. In San Francisco, HUD has deemed those earning $117,400 a year as having low income. The income is based on a family of four. In the San Francisco metro area, an income of $44,000 or less for a family of four is considered “extremely low income”; a household earning $73,300 would be “very low income”; and $117,400 is deemed “low income,” according to HUD’s latest calculations. 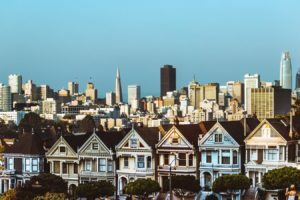 High home values that are increasing the cost of living in San Francisco are likely a big factor for a six-figure salary to be considered low income. The median home value in the San Francisco metro area in April was $947,500; the median rent was $3,300 a month. In the first quarter of 2018, only 15 percent of San Francisco county residents could afford a median-priced home, according to Paragon Real Estate Group. Despite the “low income” label, San Francisco households earning $117,400 a year won’t be able to qualify for public housing or vouchers, a HUD spokesman told CNN. Recipients of federal assistance usually earn around $18,000 a year. But San Francisco’s HUD income limit would allow some middle class workers to qualify for affordable housing developments. “Teachers, firefighters, people who work in restaurants commute crazy hours because they live so far out,” says Susan Popkin, an Urban Institute fellow. View HUD’s income limits by metro area.